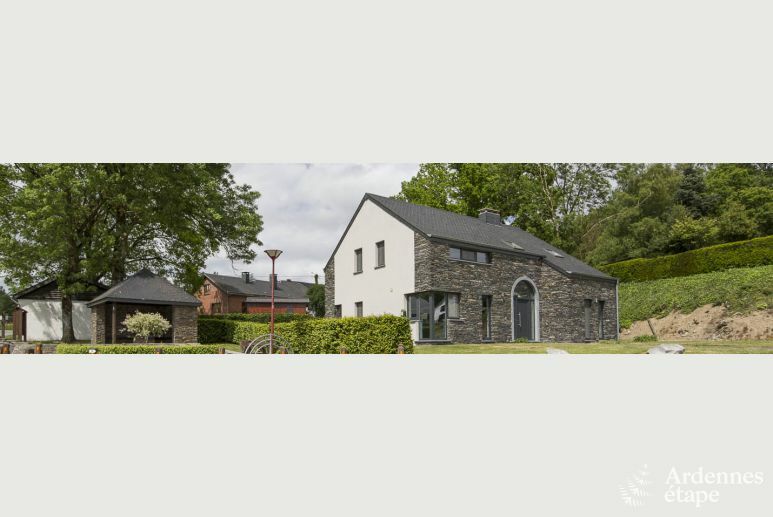 With its contemporary atmosphere and quality amenities, this holiday home offers you an unforgettable family stay close to La Roche-en-Ardenne , one of the main tourist destinations in the Ardennes . In the morning, enjoy your coffee on the terrace. And have a barbecue in the evening! Only 8 km away, you will find the village of Achouffe. In addition to offering a peaceful and picturesque environment, it is a well-known place for beer lovers, who will surely enjoy a little trip to the brewery. 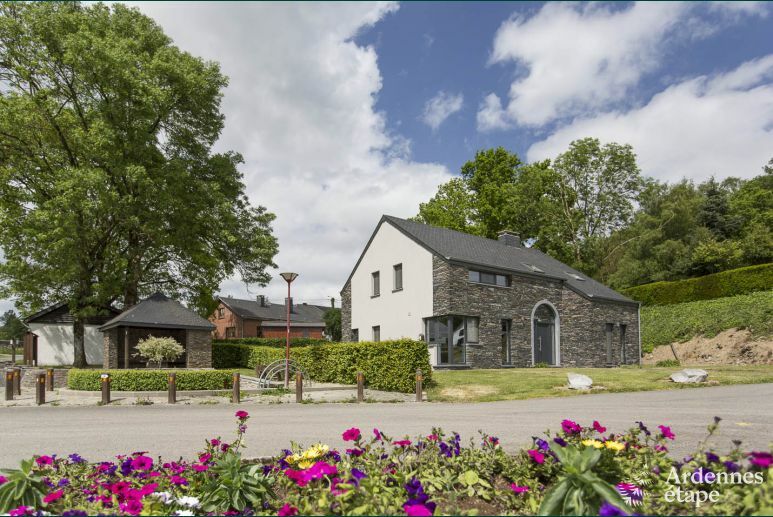 With its contemporary atmosphere and quality amenities, this holiday home offers you an unforgettable family stay close to La Roche-en-Ardenne, one of the main tourist destinations in the Ardennes. 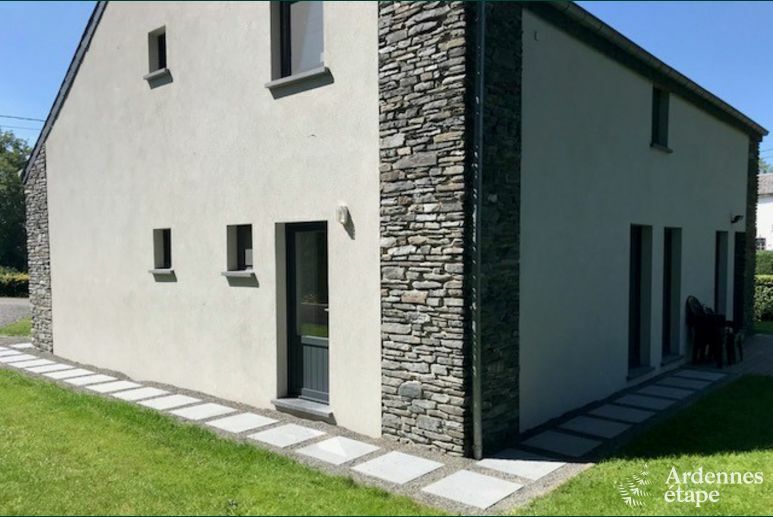 As soon as you arrive, you will be immediately charmed by the great layout of the cottage and the care that was put into its interior decoration. Everything has been thought out for your comfort, and a family of eight people will enjoy here an unforgettable stay. The four bedrooms are comfortable and tastefully decorated, so everyone will feel right at home. The living area is ideal for hosting friendly meals, having aperitifs in good mood, and sharing beautiful moments. The furniture is very elegant and modern, which makes it a place to enjoy life, especially since the large windows bring in a pleasant light. In the extension of the room, a beautiful fully equipped kitchen will inspire you to express your culinary skills. Finally, the barbecue option is always a good idea in summer to enjoy the exceptional surroundings around you. With this charming holiday cottage near La Roche-en-Ardenne, your stay will be rich in discoveries. You can visit its magnificent Feudal Castle, which exudes a unique aura. And there are several museums that are essential to learning more about the history of the region and its heritage. At the Museum of the Battle of the Ardennes, you can learn about the Second World War, while the Museum of La Roche Stoneware focuses on the geological specificities of the area and its local products. In addition, outdoor sports are an institution in the area and some original experiences await you at Moulin Bock. Finally, if you are looking for more thrills, head to the Paintball des Cheras for a fun time in an exceptional setting. To enjoy a family holiday that borders on perfection, book without delay this lovely house near La Roche-en-Ardenne.